Manufacturer Part Number F0D3003QUS. Product Model F0D3003QUS. Product Line IdeaCentre. Manufacturer Lenovo Group Limited. Product Series 520-24AST. Network & Communication Wireless LAN Yes. Product Type All-in-One Computer. 1TB Hard Drive. Powerful quad-core, eight-way processing performance. 27" Full HD 10-point multi-touch screen. Condition : Excellent shape - No scratches on the screen. There is a super tiny dent on the upper/left corner of the computer - hard to see (see pic #11). Base Clock Speed 2.7 GHz. Training / Self Study. Storage Type Hard Disk Drive. Hard Drive Capacity 1 TB. If there does happen to be an issue, we will work with you to make it right! Product Condition: Open Box with manufacturer warranty. IdeaCentre 520-27ICB All-in-One Computer. Processor Type: Core i5. Form Factor: Desktop. Check-Out Now! Limited Warranty: 1 Year. Physical Characteristics. Processor Generation: 8th Gen. This Dell Inspiron 24-3477 I3477-5852BLK-PUS PC features wireless technology to connect to the Web without extra cables, and the Bluetooth connectivity allows you to sync up speakers and other peripherals from the next room. Features LED-backlighting for a thinner, energy-efficient design. Run multiple programs at once. Base Clock Speed 2.7 GHz. Spindle Speed 5400 RPM. Wireless Mouse Yes. Training / Self Study. Processor Core Dual-Core. 2HJ19AAR#ABA HP. MPN: 2HJ19AAR#ABA. Network & Communication. Display & Graphics. USB Type-C Detail: USB 3.1-Type C. Webcam: Yes. Built-in Devices. Our warehouse will select the most appropriate carrier when your order is processed. Base Clock Speed 2.3 GHz. Hard Drive Rotational Speed 7200 RPM. Training / Self Study. Processor Core Dual-Core. Hard Drive Capacity 1 TB. Hard Drive Interface SATA. Optical Drive Type DVD RW. If there does happen to be an issue, we will work with you to make it right! Ports7 USB 2.0; 1 Ethernet. wired connectivity10/100/1000 Ethernet. eco-label/standardENERGY STAR. depth8.5 in. diagonal screen size23 in. height18 in. width22.8 in. TV tunerno. This is one of the old office computers, i5 processor( 2.4 or 1.7 GHZ ) we don't recall which, 8GB Ram and 1 TB hard drive (needs to be replaced). There is no cracks on the screen. Base Clock Speed 2.5 GHz. Wireless Connectivity 802.11ac, Dual Band 2.4 and 5 GHz, 1x1. Spindle Speed 5400 RPM. Training / Self Study. Processor Core Dual-Core. Hard Drive Capacity 1 TB. Optical Drive DVD RW. THE SCREEN I CRACKED AND THIS DOES NOT TURN ON. - FOR PARTS ONLY. Processor Type Core i5. Manufacturer HP Inc. Physical Characteristics Form Factor Desktop. Display & Graphics Screen Size 23.8". Storage Total Hard Drive Capacity 1 TB. Optical Drive Type DVD-Writer. Manufacturer Part Number F0DN0000US. Product Model F0DN0000US. Processor Type Ryzen 3. Processor Model 2200GE. Product Line IdeaCentre. Manufacturer Lenovo Group Limited. Product Type All-in-One Computer. Sony VPCL116FX All-in-one Touch Screen Computer (For parts, no HDD). Condition is Used. In good shape overall. No HDD or mouse/keyboard included. The old hard drive died and I just don't have the time to deal with replacing it. The touch screen is a bit wonky, works fine sometimes but has phantom touches at times. The fans also run pretty loud sometimes. Has HDMI and composite video in,so it can be used as an external monitor as well. Super secure. Maximize network performance Greatly improve data, voice, and video communication transfer rates over challenged LAN and Wi-Fi networks. Built-in durability Rest easy with a PC that goes the distance and is designed to pass HP Total Test Process and MIL-STD 810G testing. 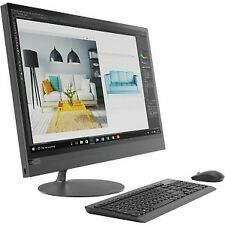 HP TouchSmart 520 All-in-One TouchScreen Computer Desktop WiFi 1TB Windows 10. HP 520-1050 (QP791AA#ABA). Condition: Fully functional, in excellent shape - No scratches on the screen (see pictures). 13.5" PixelSense Touchscreen Display (2256 x 1504). 1TB hard drive for ample file storage space. Cloud support lets you access your files anywhere. 27" Full HD multi-touch screen. Edge-to-edge glass and tilt stand. 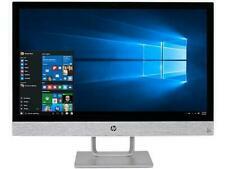 HP Pavilion All-in-One 24-x030. Optional AMD Radeon 530 graphics card for advanced video editing, powerful photo manipulation, and casual gaming. Processor Type Core i7. Touchscreen: Easily tap, touch, and wipe, right on your screen. Processor Type: Core i3. Form Factor: Desktop. Check-Out Now! Features: Security Slot. 65 W AC Adapter. All-in-One - 22-c0030. Weight (Approximate): 11.88 lb. Depth: 0.6". Sony VPCL222FX/B Specs. Bluetooth: Bluetooth 2.1 EDR. Optical Drive SuperMulti DVD Burner. Condition : Everything works except for the touchscreen feature (can be used like a non-touchscreen model). Also there is a super small crack on the upper left corner of the computer not on the screen itself (see last 3 pictures) Priced super low due to its current shape. Open Box Microsoft Surface Hub All-in-One Computer - Core i7 - 8 GB RAM - 128 GB SSD - 84" 3840 x 2560 Touchscreen Display - Desktop - Black - Windows 10 - NVIDIA Quadro K2200 - Wireless LAN - Bluetooth. I just got this all in one computer. More Product Information for the Dell 21.5" Inspiron 3277 1920 x 1080 All-in-One Computer - i3277-3838BLK. Resolution: 1920 x 1080. Inspiron 3277 All-in-One Computer. Product Model 3277. Stay connected with computing that's easy and inspiring. Modernize any workspace with an AiO PC that makes a great first impression. Processor Type: Core i5. Touchscreen: Yes. Energy Star: Yes. Check-Out Now! Limited Warranty: 3 Year. Weight (Approximate): 19.25 lb. This computer doesn’t look like it was barely used. I’m not sure what extra programs may be on it or were installed. You can use with another monitor plugged in via HDMI or VGA as shown. Includes original power adapter and wireless Lenovo keyboard. No harvesting of parts have been done on the defective product. UNBEATABLE VALUE. iPhone 8 Cases. Phone Batteries. 9425 (3.10GHz). 1TB 7,200RPM Hard Drive. 8GB DDR4-2133 RAM. AMD A9-9425 Processor 3.1GHz. AMD Radeon R5 Graphics. You are buying a Factory Sealed New HP 24 All in One Desktop Computer PN3LA00AA#ABA. This beautiful, powerful HP 24-f0040 All-in-One desktop computer has the storage to satisfy all your family's needs and help you get things done. Model: ZX4300. Unit powers on but the display does not work. Screen looks pushed in. We strive for excellence and appreciate the opportunity to work with you in resolving any issues. Since we're a liquidation house that deals with many vendors and have thousands of products online, it stands to reason that issues will arise occasionally. Manufacturer Part Number F0D7002QUS. Product Model F0D7002QUS. Processor Model J5005. Product Line IdeaCentre. Processor Type Pentium. Manufacturer Lenovo Group Limited. Product Type All-in-One Computer. Microsoft Surface Hub All-in-One Computer - Core i7 - 8 GB RAM - 128 GB SSD - 84" 3840 x 2560 Touchscreen Display - Desktop - Black - Windows 10 - NVIDIA Quadro K2200 - Wireless LAN - Bluetooth - Open Box. Condition :Works but has a broken digitizer (touchscreen does not work at all) Can be used like a non-touchscreen model. Missing stand and missing cd cover (see pictures). 1TB Hard Drive. Powerful quad-core, eight-way processing performance. Processor Type Core i3. Manufacturer HP. Storage Total Hard Drive Capacity 1 TB. Hard Drive Interface Serial ATA. Hard Drive RPM 7200. Screen Resolution 1920 x 1080. Optical Drive Type DVD-Writer. Processor Speed 2.20 GHz. Product Model 3277. Processor Type Core i5. Product Line Inspiron. Processor Generation 7th Gen. Manufacturer Dell. Processor Core Dual-core (2 Core). Storage Total Hard Drive Capacity 1 TB. Product Type All-in-One Computer. Processor Type: Core i5. Do everything you love with the latest processors and plenty of storage space available on Inspiron 3000 Series all-in-one PCs. Stay connected with computing that's easy and inspiring.